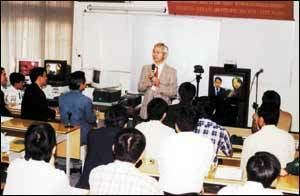 Japan’s Waseda University engages Vietnam in distance learning program. Students in language lab studying English. Nguyen An Thi, not yet three years old, has already been attending for a year, the privately-run Rainbow School in Hanoi. Sure, he’s a privileged child, but there are thousands of more young children, whose parents sacrifice, and like those in the West, provide them with a jump-start in learning. There are now over 82 million people in Vietnam—half under the age of 30—and they are the first generation to come of age in peace, and their dreams are indeed challenging previous Communist Party slogans, though the nimble new Communists are in many cases quite effective capitalists themselves. Together, Vietnam’s new young consumers are charting the course for a brighter future than any of their ancestors might have imagined and the key to their future is education. “ Presently we have over 22 million people now enrolled in the formal education system and we have over 751,000 educators of all different levels,” acknowledged Dr. Dang Ba Lam, director general of the National Institute for Educational Development in Hanoi. The signed U.S.-Vietnam trade agreement may generate educational opportunities for foreign investors. The facts are startling: The demand for quality education is huge and growing—the number of students who entered university last year represented a near six-fold increase on 1990 enrollments. There are now over 900,000 Vietnamese enrolled in colleges and universities. Students sitting tertiary entrance exams this year numbered 1.2 million and that figure is expected to climb by five percent annually between now and 2010. After all, this is a society where knowledge ostensibly brings enormous respect, where the ambition of most students leaving high school is to complete an undergraduate degree and at least one postgraduate qualification, and where the part-time language or vocational course is almost a national obsession. Education authorities reportedly plan to build a further 61 universities over the next 10 years to meet increasing demand, bringing the total number of tertiary institutions to 284.
Credit must be given to the government. Since 1986 when doi moi, or renovation started, Vietnam’s literacy rates have dramatically improved and school enrollments are up. A sure sign that the government’s present and future commitments to education might pay off. Nevertheless, the capacity of the education system is inadequate to support the rapid enrollment rates. Vietnam is a country strongly committed to education, dating back to its Confucian roots and culminating in the country’s network today of over 190 private and public universities and colleges. The World Bank estimates that 94 percent of Vietnam’s adult population is literate, a figure that is especially impressive given the country’s financial constraints and many years of war. In 1991, the government signed a law to universalize primary education, and plans to universalize junior secondary education by 2010 with senior secondary education following in 2020. These developments are indicative of the high value that Vietnamese place on education. Vietnam’s education system is undergoing a period of tremendous upheaval and change, as universities and colleges seek new ways to become more responsive to the demands of this growing student population with skill needs for the market-oriented economy. As the state ministry charged with managing Vietnam’s education system, the Ministry of Education and Training (MOET) has launched a number of dramatic and wide-sweeping reforms within the context of its present system. These include consolidating universities in an effort to pool limited resources (1995); authorizing the formation of semi-public, private and people-founded universities (1997); encouraging universities to adopt a bottom-up approach to curriculum development (1997);and lifting requirements for a mid-term exam between the second and third years of college to encourage students to complete their studies (1998). And most recently, 2000-01 academic year, MOET allowed colleges and universities to decide on student entrance criteria. 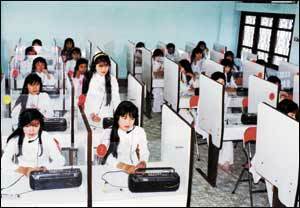 Despite such developments, Vietnam’s education sector is saddled with many serious problems. Critics contend that bulging enrollment rosters are a strain on universities already hard pressed to keep up with demand. Schools at virtually every level are running at over capacity. Low teachers’ salaries have forced many to switch to more lucrative careers, causing a shortage of at least 103,000 teachers in 1998. Among the 25,000 teachers working at universities and colleges nationwide, only about 20 percent have advanced degrees, usually from the Soviet era. Many universities and colleges suffer from old, outdated equipment, books and learning materials, and teachers have little access to new curricula and training. Efforts to produce graduates with the skills and qualifications needed to survive in the new market-oriented workplace have had mixed results; and weak overall education management combined with a lack of real institutional autonomy results in general inefficiency. At Hanoi’s respected School for Foreign Languages, Professor Nguyen Ngoc Hung, says thousands of Vietnamese are studying English as a means to gain access to more opportunities. “ Additionally, we have set up a pilot e-learning program with the New School in New York, and the focus includes a required readings on the Vietnam War,” added the former veteran Hung. The potential role of foreign investment was acknowledged last year when a Ministry of Education decree asserted that “all kinds of investment in education, including joint ventures and 100 percent foreign-invested projects” will be allowed. The policy was adopted one month before Australia’s Royal Melbourne Institute of Technology (RMIT) was granted a license to invest more than $50 million in the construction and operation of Vietnam’s first foreign-owned university in Ho Chi Minh City. Their scheduled new campus is now under construction in Saigon South, a major Taiwan financed real estate project outside of Ho Chi Minh City. Courses, include English, information technology, computer science and software engineering, are taught to an international standard and cost students between a quarter and a third of their equivalent in Australia. Recognizing Vietnam’s own valued tradition of university education, and after more than 2 years of detailed project planning in cooperation with the Asian Development Bank and the Vietnamese government, RMIT received all the necessary licenses towards the establishment of the first full foreign ownership and international curricula. “Our unique license issued directly from the Vietnamese government may very well become the future standard in the country,” added Patricia Roessler, the deputy general director at RMIT International Vietnam from their attractive small campus located in Central Ho Chi Minh City. Additionally, Tuck’s Business School at Dartmouth has been cooperating with the Hanoi School of Business. This successful program includes an exchange of faculty and students. Professor Joseph Massey, former U.S. Trade Representative to China, has been spearheading this program for several years. “Our friends in Vietnam are eager to have this shared experience with Tuck, and we in turn are mindful of the contributions we can make to providing MBA executive-level programs to Vietnam,” adds Massey. Distance Education is not strange to the Vietnamese people. Presently courses in foreign languages and test preparation lessons for university entry are offered through state-run television and multimedia tools. These are rather standard services but not enough to meet the needs of the younger Net-literate population. Some institutions are promoting “Education Without Boundaries,” a Distance Education agenda that is really an excellent education alternative and suitable for many Vietnamese students. These targeted distance learning students do not have to be concerned about international travel, accommodations, and food expenses, as well as the frequent visa denials. Despite these initiatives, Vietnam’s government recognizes that spending remains a big obstacle to providing the necessary hardware (computers) to school systems. Millions of dollars must be invested not only in equipping the country’s more than 1,200 senior secondary schools, but also in training IT teachers. Hanoi Polytech is also embracing the use of the Internet in its curriculum development and even Vietnam’s Post and Telecommunications Training Center has a special distance training network program established with Japan’s Waseda University. “Once VNPT’s distant training program network is really completed, we are certain that it will make an enormous contribution into manpower training work not only for our own employees, but also for our education in general,” stated, Chu Quang Toan, deputy director Vietnam Post and Telecoms Training Center. Vietnam, despite the poverty that still haunts it, despite the bureaucratic educational inertia, has chosen not to be left out of the digital age. All this is part of providing more tools and educational opportunities for future generations like Nguyen An Thi. After all, these children are the hope and promise for the country’s bright future.